Voice Recording software can records equally well from microphone and any other input line available with your sound card with automated start and stop if required. Recordings exported to MP3, WMA, WAV, PCM sound file format. Voice Recording software can records equally well from microphone and any other input line available with your sound card with automated start and stop if required. Recordings exported to MP3, WMA, WAV, PCM sound file format. 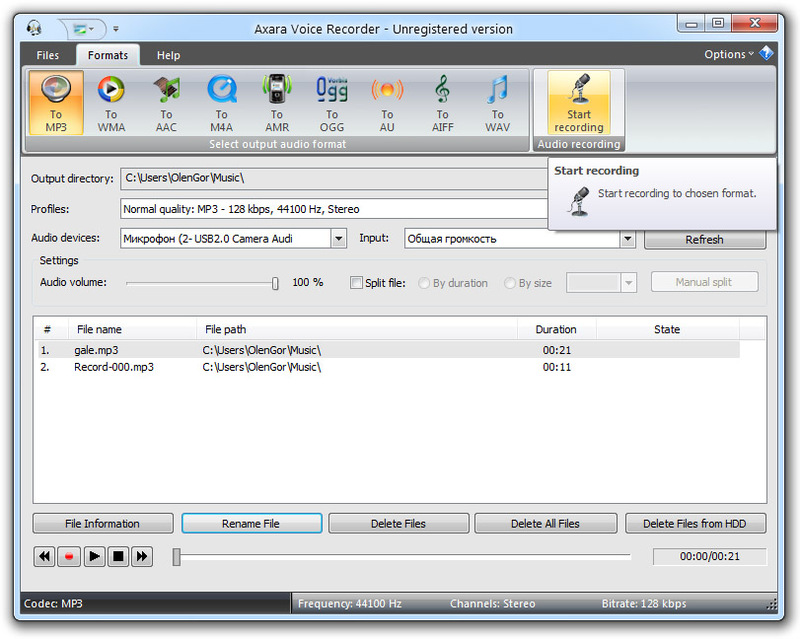 The full list of Axara Voice Recorder features follows: 1) Ease of Use: Even with its many tools and features, Axara Voice Recorder is fairly easy to use, once a user gets a hang of the basic concept of the software. The graphic user interface is very well planned. 2) Delayed Recording Timer: Is somewhat different from usual timers, as it can be used only for setting up a scheduled recording on a month pattern. 3) Voice Activated Recording: Is used to auto start a recording session whenever a predefined level of audio signal. 4) Axara voice recording software supports a number of different file formats, including some that you might not have heard of before. These file formats include WAV, MP3, WMA, OGG, AIF, AU, FLAC, AAC, M4A, GSM, VOX, RAW, RSS, AMR, MPC, APE and SPX. 5) Auto Save: Saves the file when recording ends. 6) Power Down System: Turns off the computer after saving the recording. Summary An easy-to-use application that's also powerful. Audio Recorder for Free is an audio recording application that has the ability to capture any sound like audios played by media player, internet radio broadcasting, cassette and so on. The recordings are saved as MP3/WMA/WAV/OGG format. WAV MP3 WMA M4A Audio Recorder is useful, real-time, sound-recording software that lets you record any sound from your sound card and save the recording directly to MP3, WAV, WMA, OGG, AU, AIFF or M4A files. AD Sound Recorder can record any sound playing through or any signal connected to your sound card into MP3, OGG, WMA, FLAC or WAV. It provides real-time visual monitoring of a sound waveform and sound clipping. Includes a build-in player. FlashMP3 Pro help you: Convert mp3 to flash, Record your sound, convert to mp3 or convert your sound to flash directly, publish it on the web, and share it with your friends. Riviera for Skype is a Skype call recorder. It automatically records Skype calls and conversations to MP3 files. It is convenient for recording interviews, tech talks, conferences, audio casts, pod casts for learning later, etc. NowSmart Talkin is designed for recording from Speakers and Microphone at the same time. It is easy to record your voice over background music, record calls on PC, record anything playing on the computer. Skype Call Recorder is an excellent application which works with your Skype. It automatically connects to Skype and keeps a record of every call as you want. You can also replay the recorded audio file to review the message in the call. Skype Recorder Lite has a neatly designed interface. It has simplified some seldom used functions from Skype Recorder Pro, and made itself more accurate to record personal Skype calls. Its price has decreased to less than 10 USD. This site does not contain serial number, crack, keygen Voice Recorder serial number : serial number is the simplest type of crack. A serial number(cdkey,product key,etc) is register the program as you may already know. a crack or keygen may contain harmful software. If you cannot find the exact version you want, just give it a try. for more information read .nfo/.txt/.diz file include in zipped file.